> What’s in Your E&O Policy? *Complete coverage, ONE low rate. 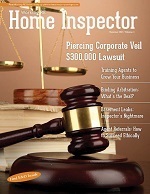 Editor’s Note: This story appears in Working RE Home Inspector Edition (May 2017) OREP insureds receive guaranteed delivery. What is an insurance broker doing telling you how to avoid wasting your money on E&O insurance? You work hard on every inspection and earn every dollar right? So when it comes to spending those dollars on insurance, you want to make sure coverage will be there when you need it. One way to ensure that you’re protected if trouble brews is to make sure your E&O policy doesn’t expire—either by not renewing it on or before the annual expiration date or by being cancelled midterm for failure to pay. You must keep your Claims Made E&O insurance policy in force to stay protected or else you’ve thrown away all the money you spent on insurance because coverage for prior inspections will be gone. Switching to another insurance provider at renewal time is fine, as long as it’s on or before expiration and there is continuity of coverage. Let me repeat and explain: allowing your Claims Made E&O insurance policy to lapse means you’ve thrown away the money you spent on insurance. And here’s why. Every home inspector’s E&O policy that I know of is Claims Made, which means the policy must be in force at the time the claim is reported. What does that mean? Say a claim surfaces today from an inspection you did one year ago, when you had insurance coverage. If you’re still covered without a lapse, the policy should respond to any covered claim. That’s the way it’s supposed to work. But say you go on vacation a few months after the inspection, forget to renew and let the policy expire— now what? Even though you were covered at the time of the inspection, the policy probably will not respond to that claim because the policy is no longer in force; you aren’t protected and the money you spent on E&O is wasted. There is no coverage even if you bought another policy a few months later and are covered today! The policy term ended when the policy lapsed. The claim did not surface and therefore was not reported during the policy term so there is no coverage for the claim today. It may seem like a “rip off” but E&O policies all work the same way—for engineers, lawyers, accountants, appraisers, home inspectors and other professionals. Again, switching coverage to another provider is fine, as long as it’s done prior to expiration. But if you let the policy lapse, coverage is gone. So, for a happy ending, renew your insurance before it expires. Note: if you plan on retiring, call your agent and ask them about “tail” coverage to protect you into the future. They will explain it to you or call us at OREP for help. Another way to protect yourself, your family and your business, in addition to renewing on time, is to report all claims and/or circumstances to your insurance agent/carrier when they happen—even the small stuff. First, reporting is easy. Companies like OREP provide a free claims help line managed by professionals who can help you nip a complaint in the bud before it turns into a claim. One surefire way to cause yourself grief is to try to “handle” a complaint yourself. Many times a professional can end a “claim” before it begins because of their knowledge and experience. 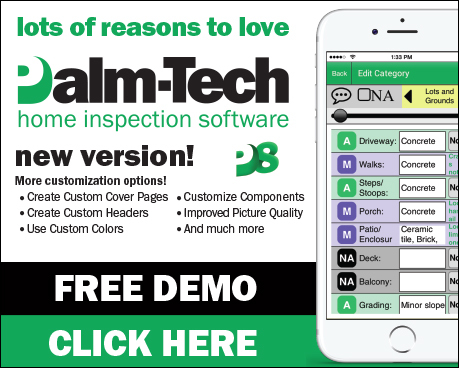 If the issue turns out to be more than a nuisance complaint, professionals are available to take the problem off your hands—so you can focus on what you know—inspecting. Reporting incidents and even claims does not automatically raise your premium either. In most cases we see at OREP, there is no penalty for reporting and getting help if nothing comes of the claim. Also see the alternative happy ending below. Let’s go back to the claim scenario described above: there is a complaint from an inspection you did one year ago but let’s say the problem surfaced shortly after the inspection when the policy was still in force (and before you went on vacation). You took my advice (unlike my teenager) and reported it right away when it first surfaced. Even if you let the policy lapse, the policy will respond to that covered claim in this scenario because you reported it during the policy period. Even if you’re not insured today! So rule two on how not to waste the money you’ve spent on insurance is to report incidents and claims right away, when they happen, to make sure the coverage is there when you need it. It is in your best interests to report all claims and incidents promptly for another reason: you are required to. The language in most E&O insurance policies requires you to report any incident or claim when it surfaces as a condition of coverage. If you fail to report a complaint when it first surfaces, a carrier can decline coverage later when it turns into something if they feel the delay hurt the defense. It’s very unusual but can happen, even if you have maintained coverage. All carriers work the same way. This is another way to waste the money you spend on E&O insurance! If there is a claim, you want the insurance coverage you paid for, so rule two is don’t ignore a claim or incident and fail to report it in the hopes it will go away. If your policy ends and the seemingly frivolous complaint turns into something later, you might not have coverage. Furthermore, if you complete a renewal application “falsely” by checking the box “no claims or incidents” and there was one that turns into something later, the carrier may cancel you. To recap: don’t let your policy lapse (going to another carrier is fine) and report claims when they happen, and you will not have wasted the money spent on E&O insurance, which is the best investment you can make to protect you and your family from financial disaster. If you never need the insurance you pay for, consider it a job well done and a blessing—not money wasted. OREP has been helping home inspectors over 15 years with their E&O insurance and has successfully placed over 100,000 E&O policies for inspectors and appraisers. We make certain that your insurance doesn’t lapse without your being aware and provide many business-building benefits along with the most comprehensive insurance policy on the market today—premiums start at around $1,000. It pays to shop OREP! 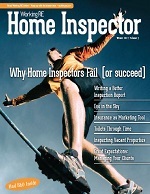 One free benefit is InspectorAdvisor.com, which answers your tough inspection questions fast! It’s like having your own mentor. We look forward to helping you with competitive rates, great service and years of experience. 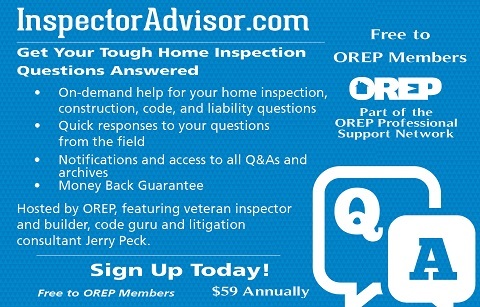 David Brauner is Senior Broker at OREP, a leading provider of E&O Insurance for home inspectors and other real estate professionals in 50 states (OREP.org). He has provided E&O insurance to home inspectors for over 20 years. Contact him at dbrauner@orep.org or (888) 347-5273. OREP–Organization of Real Estate Professionals Insurance, LLC. Calif. Lic. #0K99465.